SLANT TURN NEXUS CNC turning centers are powerful, heavy-duty for large part turning applications such as oil field pipes, pipeline control valves, turbine wheels, aircraft and off-road parts and the production of power generating components for the aerospace, oil, gas, coal and nuclear industries. Largest spindle bore in this turning center class. 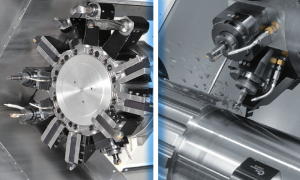 Designed for heavy-duty machining of large, long shaft workpieces. 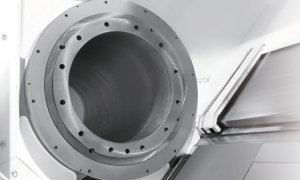 The turret is rigidly clamped by a high-index coupling for high-performance machining including intermittent cutting. Additionally, the turret can hold 12 tools, and is designed for the minimum workpiece interference with boring bars while turning. VDI-Type Tool Holders of the SLANT TURN NEXUS can be quickly loaded/unloaded by turning a single bolt for minimum tool setup time. 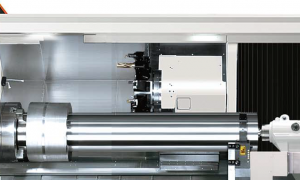 Additionally, the rotary tool spindle of the SLANT TURN NEXUS has a maximum speed of 4000 rpm and output of 7.5 kW (10 HP) to provide performance comparable to a small machining center.